I love cooking seafood on the grill because it’s so fast and, because most seafood is relatively mild, it readily absorbs smoky flavors. Plus seafood is super-healthy—it’s an excellent source of lean protein and some types of fish, such as salmon, are good sources of omega-3 fats, which are good for your heart and your mental health. Click here to find out 6 of the best fish and shellfish to eat and 6 to avoid. • Oil it up. We scrape the grill grate clean with a grill brush and oil the grill rack before the food hits the hot surface. It greatly reduces the risk of sticking. See a photo of how to safely oil the grill rack here and get 12 more essential grilling tips. • Grill on foil. This is good if you want something like herbs underneath the fish, as in Grilled Salmon with Mustard & Herbs or if you are working with grilling shrimp or other foods that are small enough to fall through the grate. 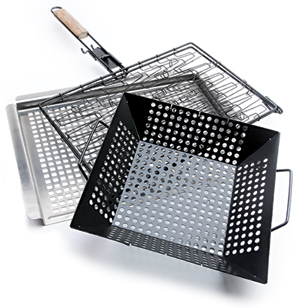 • Use a grill basket. Sometimes we use a fish basket if we are cooking larger fillets or whole fish, as we do for our delicious Grilled Fish Tacos. It makes flipping the fish over on the grill easier and the fish is less likely to break.